Enough with the tedious beauty regimens, the All-in-One is all you need to get the combined effects of facial lotion, beauty essence, moisturizer and sunblock for that flawless facial experience. Made from the choicest ingredients to achieve the beauty benefits of skin whitening, anti-aging, moisturizing and UV protection. The ingredients are easily absorbed by the skin, are non-sticky, effective for all skin types and act as a great make up base. The All-in-One Facial Cream boasts of a 70g content compared to the usual 50g creams in the market, which means that every pot lasts longer, resulting to more beautiful skin for less. Every step entailed in developing Mosbeau Placenta White is done in Japan—clinical research, ingredient sourcing, product development, manufacturing, and packaging—utilizing their advanced technology and keen eye for perfection. When Ms. Bestie contacted me about Mosbeau, there was no hint of hesitation at all when I agreed to review their products. This is not the ordinary cream as I have expected but a gel type facial cream. It reminds me of my Neutrogena Hydroboost Gel but this one has a different feel to it. This is light on the skin. No greasy feel, however, unlike my Neutrogena Hydroboost Gel, this does not dry quickly. It feels as if I applied an essence or serum on my face and I can actually feel the slowly seeping through my skin. Usually by this time of the year, my face would get so dry and scaly but my face feels softer and supple. 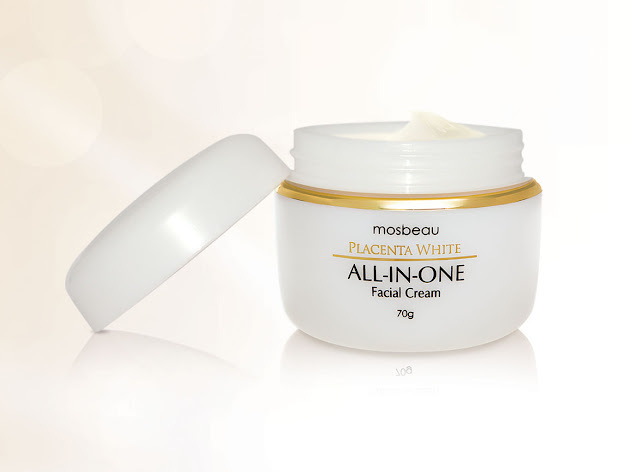 It acts as an all in one facial cream - an anti aging serum, moisturizer and skin whitening cream. Because of this, you can skip a lot of steps on your beauty regimen. It hydrates my face and keeps my face very soft and supple. It does not make my skin oily or greasy and it is a good makeup base. I can instantly use my powder or powder foundation without the fear of dry patches on my skin. It did not break me out. No rashes at all. Pricey!! It costs 1,480 pesos. I suggest you but the set with soap to save 200 pesos. It has that distinct scent like plastic or something. I wished they added a subtle scent to it. It says it has UV protection but it does not say how much SPf it has (are these two different?? I actually do not know!!haha). Hence, I still use my Belo Facial sunblock. A tip from MLI: Try spraying your facial mist before applying this cream (this will reduce the use of this cream, just a two pea sized amount will do). This will also help your skin absorb more moisture. For more info about Mosbeau products, you may email me at milet@mosbeau.com.ph or SMS/Viber me +639054953479. We have promos and discounts. Thanks.